So, while the United States was assuming a more active role in the world, what was happening back at home? The American people rejoiced at their victory at the end of World War II, but they quickly found themselves fearing a new enemy: communism. The involvement of US troops in wars against communist forces in Korea and Vietnam inspired a fear of communism reaching the US itself - anyone suspected of being a "commie" was regarded a traitor. As time wore on, the American peoples' mood began to change. By the late 1960s the Vietnam War had become very unpopular, and the Anti-War movement began to gain strength. At the same time, public opinion was slowly turning against the segregation of white and black people, and a new civil rights movement was emerging. In this section, you will look at how these events shaped and influenced the foreign policies you learned about in the last section. Presidents Truman, Eisenhower, Kennedy and Johnson each had to deal with these issues. How did they deal with them, and what did that mean for America's place in the world? 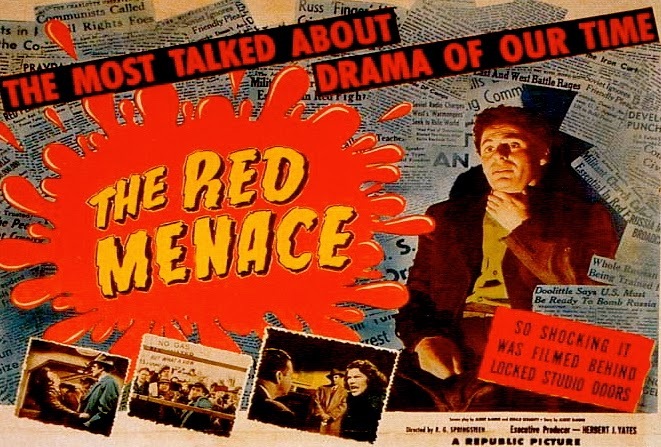 Who was Joseph McCarthy and how did he spread the Red Scare? Who did he accuse? What were his investigations and hearings like? What led to his downfall? What influence did all this have on US foreign policy? What reasons did people have for opposing the wars? What impact did student protests have? What impact did the Tet Offensive and Johnson's unpopularity have? What was the credibility gap? Anti-war Politicians: Who opposed the war? What influence did they have? Kent State: What happened here? Loss of Trust: What impact did the My Lai massacre have on public opinion? What was President Nixon's response? Desegregating the Armed Forces: Why did this happen? Publicity and Image: Why were presidents concerned with how other countries saw segregation in the US? The Vietnam War: What impact did the war have on black communities? What changes were made in the military? 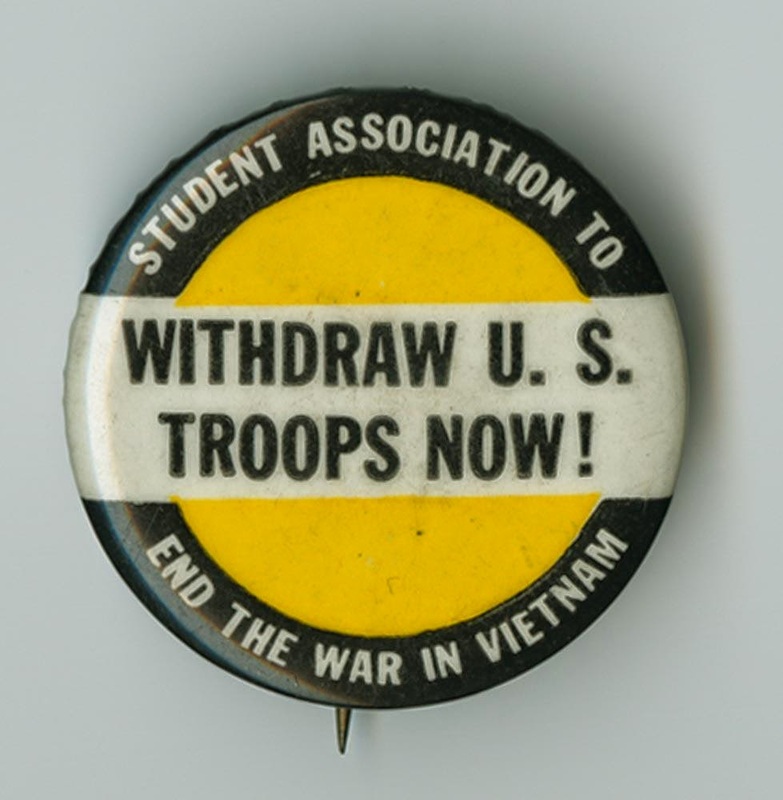 An anti-war pin from the 1960s. 2016: During the period 1945-1989, what was the impact on US society of McCarthyism and/or the anti-war movement? 2013: What were the main developments in race relations in the US, 1945 - 1968? 2012: How well did President Harry Truman or President Lyndon Johnson handle the challenges he faced? 2007: How did McCarthyism and/or the anti-war movement affect US foreign policy, 1945-1972? 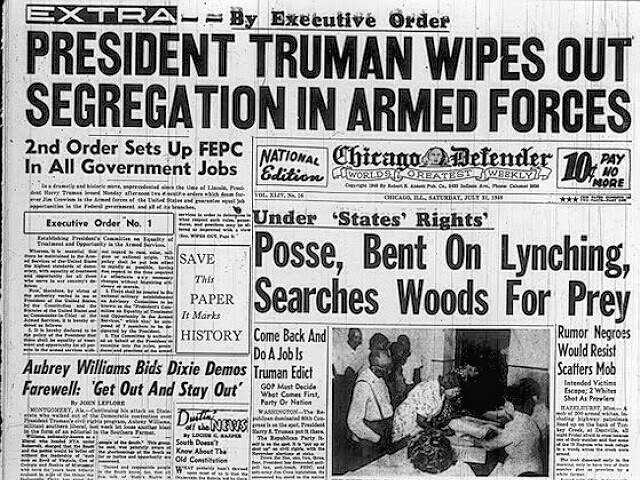 The Chicago Defender reporting on President Truman's order to desegregate the Armed Forces. Note the second biggest headline - racism was still prevalent in many parts of America at this time. Ah very useful and straight forward. Sorted for my history test tomorrow thanks. You're welcome, good luck tomorrow.